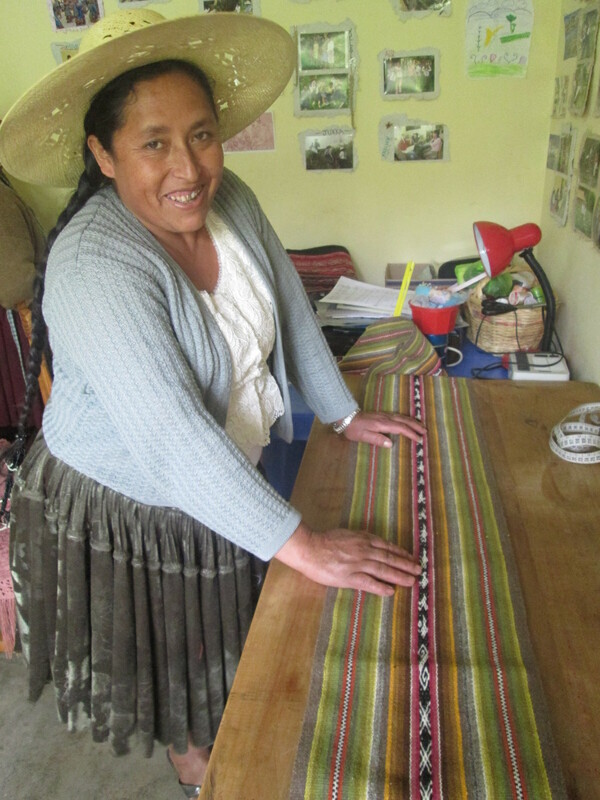 Weavings are an integral part of the farmer subsistence lifestyle. 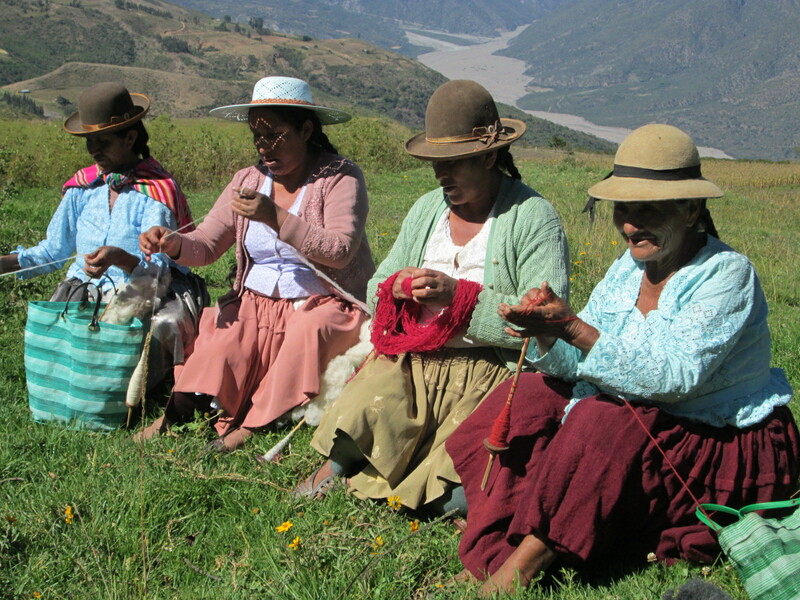 Their importance as to the identity of a woman as weaver is diminishing along with that lifestyle. Today girls spend their day in the classroom not walking the countryside hand spinning while pasturing the family’s flock of sheep. The fierce competition between teen girls to weave exquisite aguayos to debut for dancing in Carnaval no longer happens. 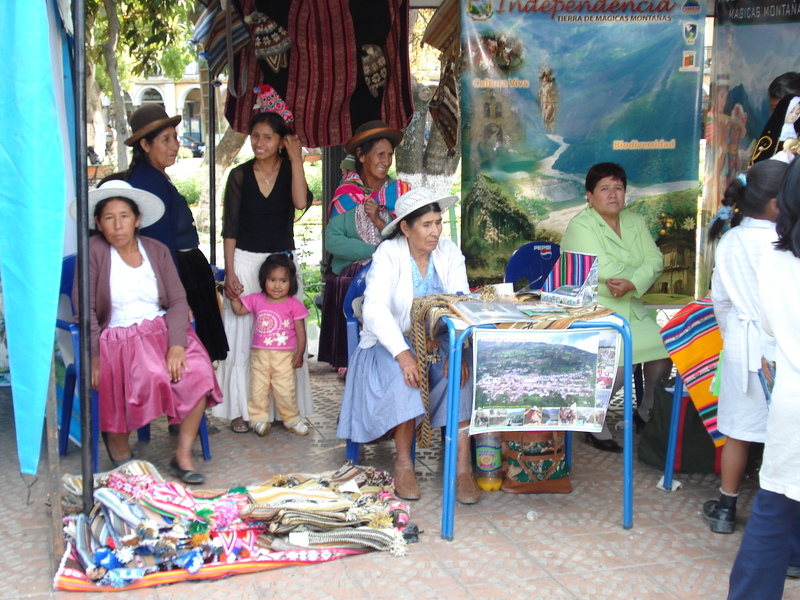 Aguayos (the Andean backpack) are still widely used, but tend to be machine made and inexpensive to purchase. The break in the passing of the weaving tradition from one generation to the next widens with each passing year. 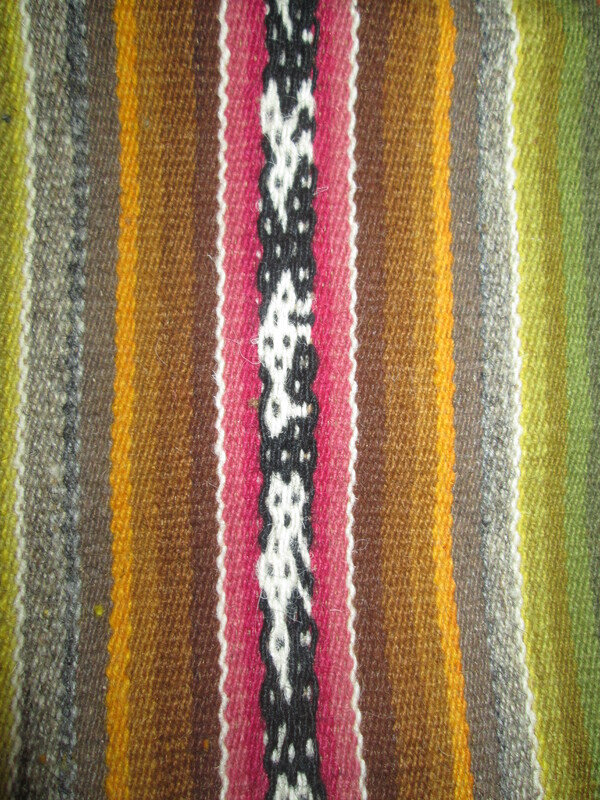 PAZA evolved from a request from the weavers of Huancarani in 2007 for assistance to rescue natural dye techniques and market their weavings. They were intrigued to learn more about cochineal after a non-profit organization had presented a one day workshop in their community. PAZA was the name of the Peace Corps partnership grant I wrote to be able to contract trainers for our first natural dye workshops. Our first sales effort was a one day fair in 2007 in Cochabamba where we stacked the textiles on the ground for lack of a table. 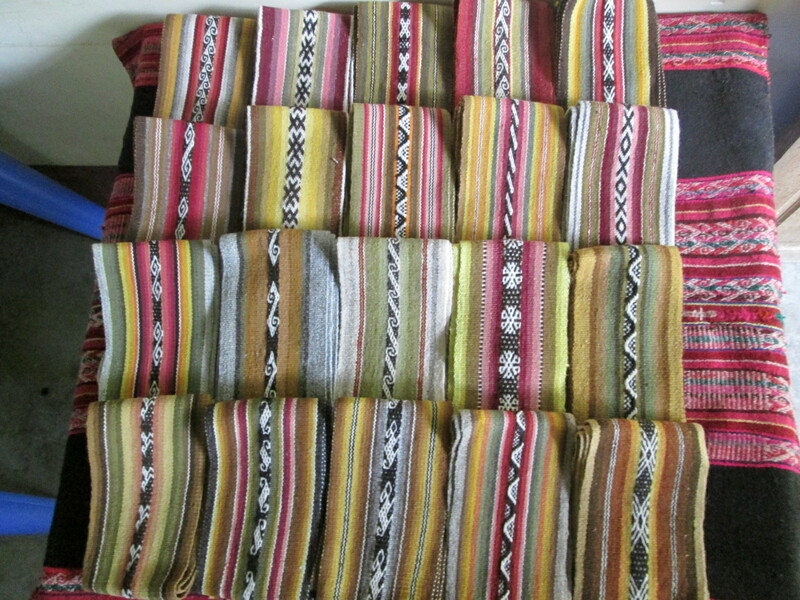 The weavings were crudely assembled chuspas (shoulder bags) in natural wool colors or woven from bright synthetic yarn and knitted chulos (Andean caps with ear flaps). The price tags carried whatever price the weaver had requested, which was around $7 for a ch’uspa (minimum 40 hours of labor to produce) and $3 for a chulo. Since 2011, pricing has been formula based and they approve that pricing annually. Years of improving natural dye techniques, listening to commentary from potential buyers at fairs, and the feedback from fair trade buyers have resulted in the evolution of the weavings. Although we still take a few ch’upsas to fairs, the majority of the products for sell are professionally assembled in Cochabamba to target an external market. 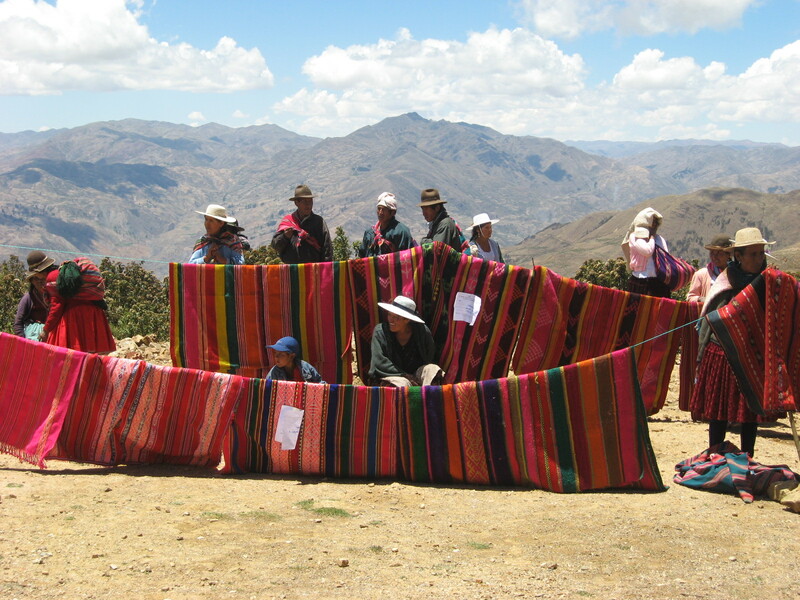 The Huancarani weavers no longer weave on speculation, but weave to a specification for an order. Providing the weavers the security of a payment upon completion of an order is possible thanks to the ongoing support from Ruraq Maki and ClothRoads who sell the weavings through their online stores, Laverne Waddington who places an order annually for traditional weavings to use in her weaving workshops, and WARP members who purchase woven products at the annual WARP Marketplace. Since 2011, PAZA has tried to debut 2 new test products at the annual WARP Conference (Burlingame, California, May 29-31, 2015). Our failures in new product design outrank the successes, but lessons learned aid future design attempts. The first new products were bags that paired the textiles with leather, and the results were spectacular. Unfortunately, the majority of the cost went to the leather workshop instead of the weaver. After PAZA invested in contracting a weaving instructor for our floor loom it was warped with bayeta spun yarn to weave wool cloth to back pillow covers. 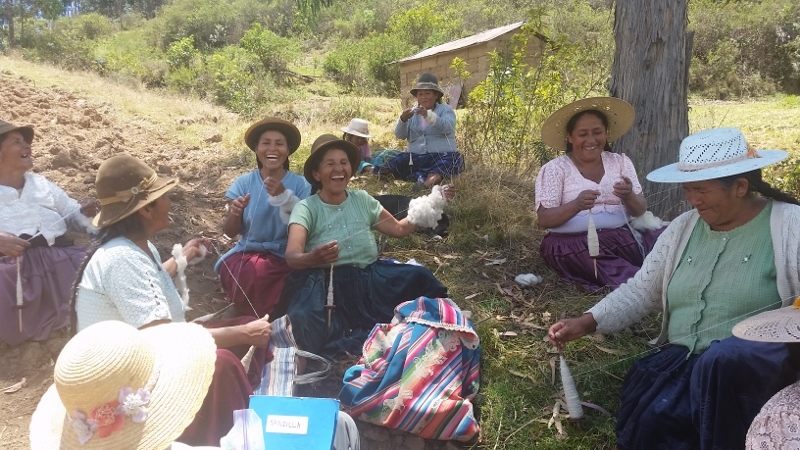 The yarn kept breaking which frustrated Doña Máxima and Doña Antonia who were doing the weaving. They never complained, but it took them 8 months to weave a short length of cloth. The results were poor due to the quality of the wool. Purchased bayeta had been dyed and used in the interim, but the majority of the pillow covers remain in inventory for lack of sales. 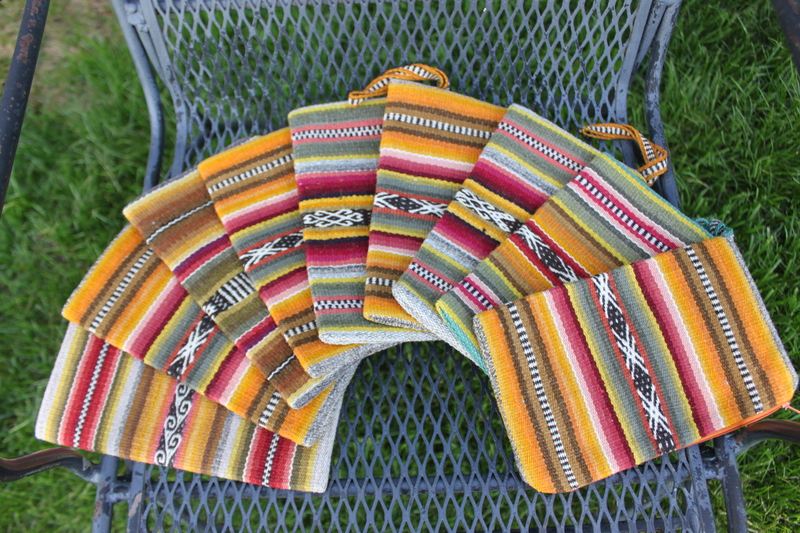 Amanda Smiles, founder of Ruraq Maki, has worked with volunteer designers in San Francisco the past few years and has brought patterns for test bags during her past 2 annual visits. Those bags can be viewed or ordered on the RM online store. Topics of conversation during her 2013 visit bounced between new product design and how to motivate pre-teens and teens to learn how to weave. 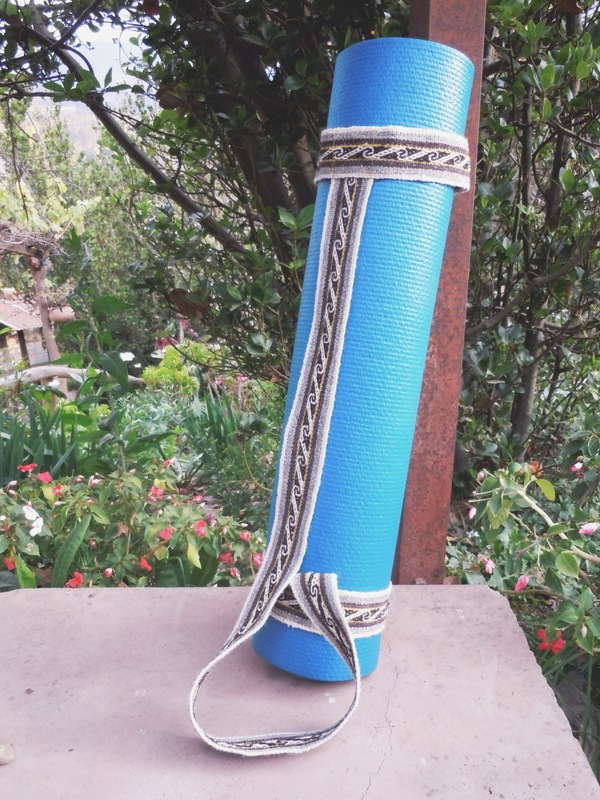 Amanda hit upon the idea of a yoga mat strap after we lamented the lack in sales of guitar straps. The beauty of the guitar straps is that they require a variety of traditional woven figures and the labor is less time consuming but the price to the weaver is higher then what the market will bear for the larger weavings used to make the popular zippered bags. It is the weaving of the figures that is being lost. Rural women continue to weave functional items for the home, such as blankets (phullus), but they forgo weaving figures in order to weave quickly.